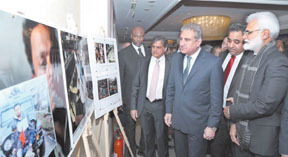 LONDON: Foreign Minister of Pakistan, Makhdoom Shah Mahmood Qureshi, inaugurated an Exhibition on Kashmir marking the observance of Kashmir Solidarity Day in London, today. British Member Parliament Imran Hussain, and Chairperson of World Congress of Overseas Pakistanis (WCOP), Mr. Naheed Randhawa, jointly hosted this exhibition in a show of moral support to the oppressed Kashmiri people in Indian occupied Jammu & Kashmir where grave human rights situation has attracted the world attention. The event was attended by a large gathering of guests including British Parliamentarians, members of Cross-party Foreign Relations Committee of the Senate of Pakistan, Local government Mayors and Councillors, representatives from civil society organizations, students, Kashmiris and members of the British Pakistani Diaspora. The exhibition showcased a wide array of photographs that shed light on the plight of innocent Kashmiris, particularly pellet gun victims including women and children who suffered from injuries at the hands of Indian security forces in IOK. A part of display of Indian atrocities pertained to genocide and dozens of massacres carried out by the Indian occupation forces. A number of Kashmiri artefacts were also on display along with pictures depicting the heavenly landscape and pristine beauty of Jammu & Kashmir. They stood in sharp contrast to the present-day situation where violence continues to inflict suffering upon the people of IOK through use of draconian laws and Indian state sponsored terrorism in complete disregard and violation of the UN and other International Conventions on human rights. On the occasion, a number of documentaries and slide shows pertaining to the people of Jammu and Kashmir’s endless sufferings were also shown to the jam packed venue. The pictorial presentations were reflective of the crimes against humanity committed by Indian state agencies. Kashmiri traditional songs were also played during the event. In his remarks as Chief Guest, the Foreign Minister, while highlighting the prevailing human rights situation in the Indian occupied Jammu and Kashmir, condemned the ongoing atrocities and expressed solidarity with Kashmiris in their struggle for their legitimate right to self determination, as also enshrined in the relevant UN Security Council Resolutions. He assured that the Government and the people of Pakistan remain steadfast in their moral, political and diplomatic support to the Kashmiris. Pakistan Government and its people spare no occasion to create awareness on Jammu & Kashmir with the view to ensuring that bloodshed in Indian Occupied Kashmir is halted immediately and unconditionally and that the perpetrators of crimes against innocent Kashmiris are brought to justice. The High Commissioner for Pakistan, Mohammad Nafees Zakaria, while speaking on the occasion, called for a peaceful resolution to this dispute that remains one of the oldest unresolved agenda items at UN Security Council and delivery of justice to the Kashmiris. President AJK Sardar Masood Khan urged the international community to speak for the voiceless and oppressed Kashmiris. British Parliamentarians who spoke at the event included Imran Hussain MP, Lord Qurban Hussain and Debbie Abrahams MP. Other speakers included Mr. Naheed Randhawa, Barrister Sultan Mehmood and Chuadhry Muhammad Yasin.